"After being shown the Yamaha MM6, I fell in love with it and had to have it!" Over here at Yamaha Musician.com, we pulled up a bench, snatched a sustain pedal and went to work evaluating the Yamaha MM6. At first glance, the MM6 is stealthy looking and incredibly light (about 11lbs.) which is great for gigs or taking it to a friend's house for some jamming. This keyboard is a 61-key, 32-voice, five-octave keyboard with an eight-track sequencer (ninth track for rhythms), and 70MB of sound wave data consisting of hundreds of patches, FX programs, and rhythms. The MM6 was obviously laid out to give you quick control over very commonly used features such as the four real-time knobs to tweak your sounds, your sequencer for recording, and the very handy arpeggiator for creating some impressive patterns and rhythms for your sequences. 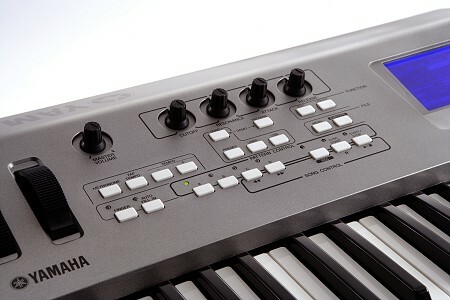 The Yamaha MM6's sounds were derived from their Motif workstation pro-series keyboards. However, we were mostly impressed by the synth lead and pad programs. There were lots of big beefy synths, and lush sweeping pads. There were some choir programs but they were dull sounding. The keyboard and organ programs are also worth mentioning. We were impressed with the electric piano programs (5 different variations) especially the Galaxy EP program which is DX-7 nostalgia. There were lots of great organ programs too (about 20). They ranged from dark to bright, percussive and jazzy with rotary effects preset. If you need decent guitar/bass sounds, the Yamaha MM6 delivers. The acoustic guitars were very expressive; the harder you hit a key, the guitars got brighter and seemed almost like it went from being plucked by a finger to plucked by a fingernail. Naturally, there were steel, clean, funk, 12-string, distortion, and wah-wah guitars available in the arsenal too. Some of these programs utilized the arpeggiator making for some really cool pre-programmed guitar rhythms and some stares by people. For those interested in movie soundtrack type of sounds, the strings and brass categories will be of interest to you. There are some lush spacious string, pizzicato, and ensemble programs and, of course, the individual string instrument programs including harps, orchestra hits, and a contrabass. I really liked the lush string programs over the individual string programs. The pre-programmed vibrato on the violins and cellos weren't that great, however, I have yet to come across a keyboard that does deliver a realistic vibrato. The brass sounds contained sawtooth, ober brass, trumpets, and trombones. I'm not really sure why Yamaha chose to do this, but they also had woodwind instruments such as saxes, bassoon, clarinets, etc... in this category. However, I was impressed with the trumpet and muted trumpet programs followed by the clarinet and English horn programs. In the ethnic sound category (which should really be renamed to the Japanese Instruments category) contained mostly plucked Japanese string instruments. However, there was a sitar program and maybe one other Indian instrument in here too. I really liked the Yang Qin program—it sparked some fresh ideas for a song. Another odd thing I found that Yamaha did was to classify the Banjo under Ethnic sounds. What? Last but not least, the Yamaha MM6 has an extensive drum, percussion, and FX library, full of drum kits from dance, hip hop, and, rock, just to name a few. The FX library is stocked with some interesting sounds from dogs barking to a UFO taking off. The Yamaha MM6 gives you the ability to control your sounds in real time via the cutoff, resonance, attack, release knobs located to the left of the LCD display. These knobs are especially great when playing a fat sawtooth lead and you want to add some wah-wah effects to your sounds. I would have liked to see these knobs be assignable but that's a feature you would normally find in higher-priced keyboards. The on-board sequencer allows the user to record up to 8-tracks plus one track for a rhythm track and room for saving five songs or performances as Yamaha calls it. That was disappointing. There's no reason why the industry standard 16-track sequencer couldn't have been implemented here and more than five slots for saving user songs. However, you can save up to 400 songs if you have a USB device attached to the Yamaha MM6. Recording is very straight forward—just press the USER button, RECORD button, and then the track number and start playing to record. Press STOP to end recording. The sequencer doesn't allow you to edit your recordings. All you can do is delete and mute individual tracks. The effects processor has over 200 DSP programs. There are 25 reverb, 30 chorus, and 189 other effects programs such as halls, rooms, plates, EQ's, delays, echos, flangers—the list goes on. They can be applied and individually adjusted for the main, dual, and split voices. Other features include a metronome, an arpeggiator with 213 preloaded programs, 168 auto-accompaniment pattern styles, mod and pitch wheels, and the 320 x 240 back-lit LCD all packaged in a sleek silver trim that weighs in at a little over 11 lbs. The Yamaha MM6 is that keyboard that falls in between a professional synth and a preset machine. This would be a great synth to take around as a back up keyboard on a gig or when space is limited, however, its all-plastic design will not be able to take a beating on the road for very long. We wished it had a 16-track sequencer rather than an 8-track and had aftertouch, but at a street price of around $600, the Yamaha MM6 has some features that are found in keyboards three times its price. Overall, we were very pleased with this keyboard and would recommend it to the musician who wants his/her first keyboard and not out grow it anytime soon without breaking the bank, and to the musician that needs a machine to quickly record his/her ideas on the fly.